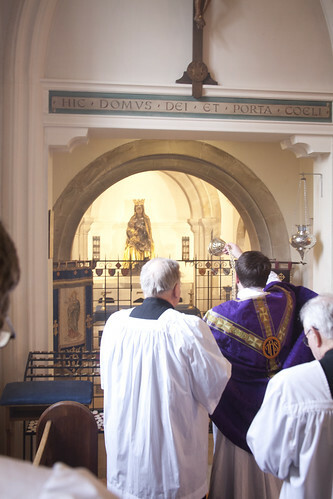 Last Saturday I attended two Masses: the annual LMS Pilgrimage to Our Lady of Caversham, which I organise myself as Oxford Rep, in the morning, and a Solemn Requiem for Chris Inman, one of my predecessors as Chairman of the Latin Mass Society, in the afternoon. 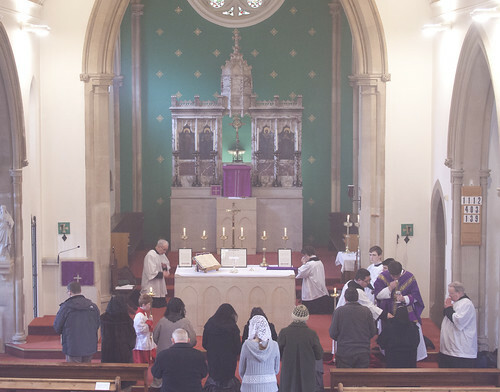 The Pilgrimage Mass was celebrated by Fr Daniel Lloyd of the Ordinariate, in the shrine church, that is Our Lady and St Anne, Caversham. Caversham is over the river Thames from Reading, and is the southernmost tip of the Archdiocese of Birmingham. This the diocese's official Marian shrine, the restoration of a very ancient and prestigious medieval shrine, consecrated in 1958. 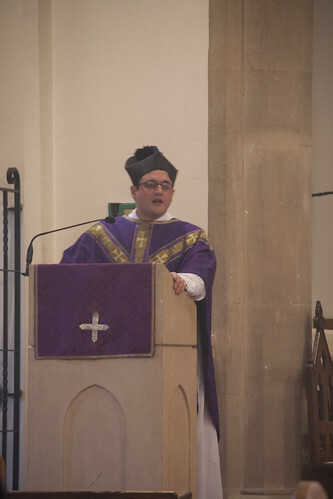 It was Ember Saturday, and we had the full version ('forma longior'), with five Prophecies (readings from the Old Testament) in addition to an Epistle and Gospel. Who says the EF doesn't give you plenty of Scripture? 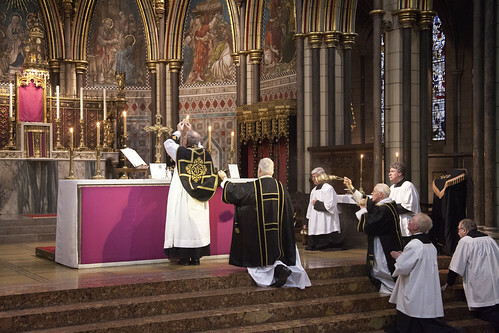 A shorter version of the Ember Saturday Mass was created as an option in 1962, which must have been a relief for priests saying private Masses. But the full version is an ancient and wonderful liturgical feast, and the pilgrimage is a good opportunity to celebrate it. 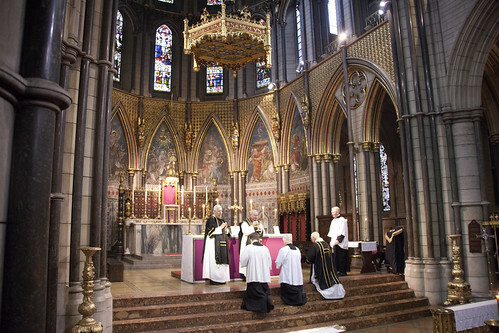 For the first time on this pilgrimage, we used the High Altar, partly to facilitate the extra readings being sung, not from the altar but as shown above. The shrine proper is in a rather small chapel. At the end of Mass Fr Lloyd processed to the Shrine chapel and incensed the very lovely shrine image, a medieval Virgin and Child, while we sang the Ave Regina Caelorum. 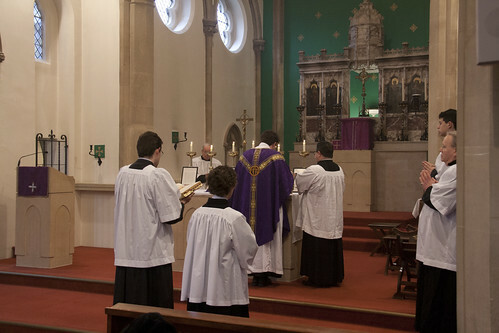 Mass was accompanied by the Schola Abelis (for chant) and the Newman Consort (for a polyphonic ordinary and a motet). After Mass in Caversham, and while the singers and Fr Daniel were having a rather jolly lunch, I jumped onto a train to London to attend Chris Inman's Requiem. This was, as befits a former Chairman of the LMS, a Solemn Requiem, in St James's Spanish Place, a stunning church. It was celebrated by Mgr Gordon Read, the Latin Mass Society's National Chaplain. Chris' family were there, and a number of representatives of the Latin Mass Society, as well as me. I mean, heck, if we can't do this for him, what would that say? 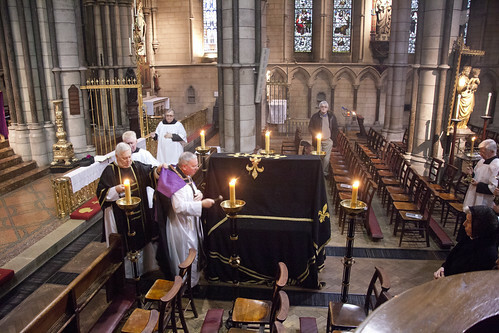 We had a catafalque, and Mgr Read blessed it with holy water and incense. 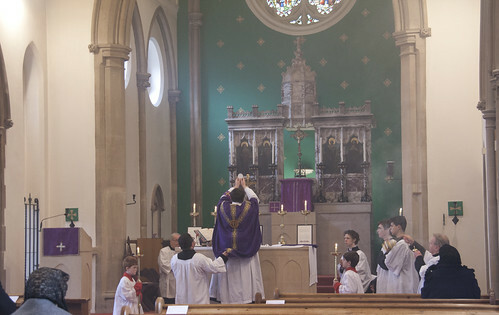 Mass was accompanied by the singers of St James' own, highly competent, choir, with chant. Chris Inman died on May 25th 2012. He worked hard for the Traditional Mass over a many, many years, being most prominent during some of the leanest times, the 1980s and 1990s. We owe him and his generation a lot for keeping the lamp lit in those decades. 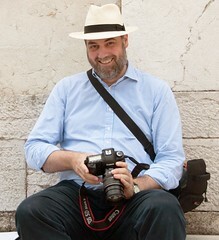 A little insight into his work is given in this Mass of Ages article (see the last item).